Diagnostic tests are used by doctors in order to better assess your health situation. These tests can be used to help establish your initial diagnosis, assess the effectiveness of the treatment you are receiving and/or detect potential complications. Some tests are simple, so simple that often you are unaware that they are happening, like a dipstick analysis of a urine sample. Other diagnostic tests are obvious enough for you to be aware of – like having your blood pressure, temperature and pulse checked. Another group of diagnostic tests considered to be low-risk and non-invasive include x-rays or ultrasound scans. As soon as the requirements of a specific test involves entry of a needle or a probe into your body, they are considered to be ‘invasive’. These tests include procedures such as blood tests, kidney biopsy or x-rays that require an injection of a dye. Why Are Diagnostic Tests Important? Diagnostic tests are often an important part of establishing what your health problem is in order that your doctor and nurse can deliver the treatment and care that will best suit your health care needs. The doctor can use other assessment skills to assist in this problem-solving process. These skills involve drawing conclusions from a person’s medical history and performing a physical examination. However, a diagnostic test is often required to establish a diagnosis, to plan an intervention, or to monitor progress. What does a dipstick urine test show? A dipstick urine test, also known as a urinalysis, is a very simple test that is commonly done in clinics or when admitted to the hospital. You will be supplied with a sterile container and asked to carefully pass urine into the container to avoid the sample being contaminated. A nurse will insert, into the urine sample, a special strip that can detect protein, blood, white blood cells and glucose, in the urine, according to the changing colour of the strip. Protein – this is an important building block in the body. When your kidneys are damaged, protein leaks into your urine (proteinuria). Persistent protein in the urine suggests damage to your kidneys. Blood – The sample will be examined for colour and clearness. If blood is present, the urine may look red or the colour of cola. This may indicate an infection. White Blood Cells – Presence in urine indicates infection. Glucose (sugar) – Presence in urine may indicate diabetes. What is Urine Culture and Sensitivity? This is a 'mid-stream' urine sample. Do not collect the first or last part of the urine that you pass, which may contain bacteria or cells normally found on the skin. This is then sent to the laboratory to be examined under a microscope, which can help to diagnose some kidney diseases. Many things can be seen - like red blood cells this can be a sign of kidney disease that damage the filtering units of the kidney, allowing blood cells to leak into the urine. It may also indicate other problems such as kidney stones. White blood cells, crystals, and bacteria can also be detected if there are bacteria or white blood cells and this may suggest urine infection. To confirm this, bacteria are allowed to grow on special plates overnight (culture). This allows the doctor to prescribe the most effective treatment for you. Kidney function is most precisely measured by calculating the Glomerular Filtration Rate (GFR). This is a precise estimate of the level of kidney function and can predict the time when kidney replacement therapy is likely to be needed. GFR can be determined by doing a 24 hour urine collection and a blood test. 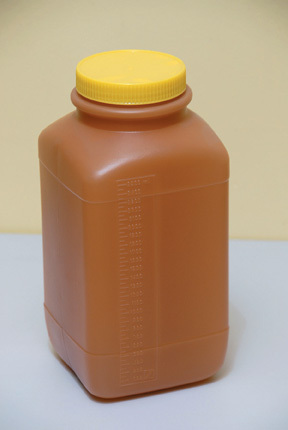 You may be asked to complete the urine collection, at home, or when admitted to hospital. You will be given 1-2 large urine collection bottles and asked to collect your urine over 24 hours. It is important to discard the first urine sample of the day into the toilet and then collect all urine for the next 24 hours into the bottle(s). On the second day, the first sample of urine should be collected. The collection is then complete. A blood test is taken when the urine collection is completed. It is important that the collection is properly carried out or the results will be wrong. Urine protein testing is used to detect protein in the urine to help evaluate and monitor kidney function and to detect and diagnose early kidney damage and disease. A protein to creatinine ratio is a snap shot of how much protein is present, in the urine, at the time it is collected. There are many different reasons why there is protein in the urine. This test may be ordered on a random urine sample if a person shows evidence of significant and persistent protein in their urine or has known kidney damage that the doctor wishes to monitor. It is collected by either a 24 hour urine collection or a midstream urine sample. Blood tests are regularly carried out to measure how well your kidneys are working. The table on the next page outlines some of the blood tests that will be performed and what they mean. Urea(Ur) 2.5-8.5 mmol/L A waste product produced in the liver and excreted by the kidneys. High values might mean the kidneys are not working as well as they should. Creatinine (Cr) 49-90umol/L A waste product produced largely from muscle breakdown. High levels, especially with high Urea levels, indicate problems with the kidneys. Sodium (Na) 135-145mmol/L The balance of salt and water in the body. Potassium (K+) 3.2-5.2mmol/L Important for proper functioning of nerves and muscles, particularly the heart. High and low levels require medical evaluation. Potassium comes from food, especially fruit, vegetables and nuts. Calcium (Ca) 2.12-2.62mmol/L Excreted by the kidney. Important for muscle contraction, cardiac function and blood clotting. Phosphate (P04) 0.7-1.5mmol/L Excreted by the kidneys. Necessary for strong bones, teeth, normal functioning of muscle and blood clotting. Albumin 30-50g/L Protein in the blood made in the liver. Low levels may indicate that protein is leaking into the kidneys or if someone is malnourished. Parathyroid Hormone 15-65pglm Concerned with the regulation of extra-cellular Hormone calcium levels. Iron Studies Ferrithin 18-240nglml Main stored iron found in all tissues. 13.0-16.0gm/dl Complete blood count is the red protein in blood. It carries oxygen around the body. One of the kidneys function is to produce erythropoietin (EPO), which stimulates the bone marrow to produce red blood cells. When kidneys fail it may be necessary to give EPO in the form of an injection. White Cell Count 4-11 10^g/l White blood cells fight infection in the body. Raised/low levels may indicate infection. Checks for the presence of hepatitis infection. A plain abdominal x-ray is used to show the kidneys, urethra and bladder (KUB). It also indicates the size, shape, position and the presence or absence of one or both kidneys. What preparation is required? There is no preparation required for this test. This is a non-invasive procedure where a transducer (sonar probe) is moved in close contact over the skin over the area of investigation and it can be repeated frequently if necessary. 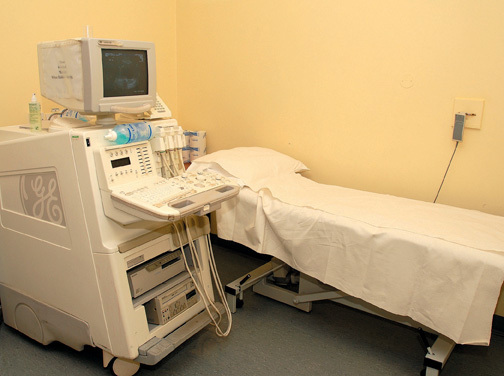 Ultrasound is used to determine the size and shape of the kidneys, to check both kidneys are present, location of kidneys and is useful in detecting cysts. What preparation is required? You will be asked to wear a hospital gown. Depending on the area of ultrasound you may be asked to fast prior to the procedure. Your doctor/nurse will inform you if this is necessary. There are no risks attached to this procedure. 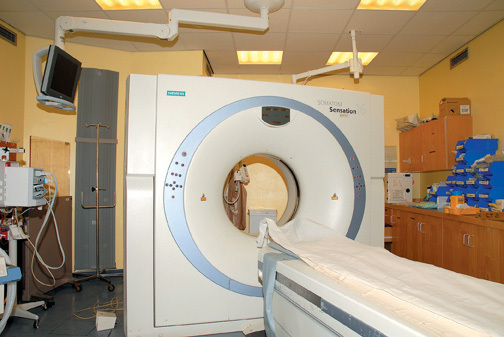 A CT scan, also known as a CAT scan, is a specialised xray which provides clear pictures of the inside of your body. In particular, it can give good pictures of soft tissues of the body which do not show on ordinary x-ray pictures. your mouth for a short time. Your doctor will prescribe a course of medication (n-acetylcystine) to take on the day before the scan, the day of the scan, and the day after. This medication protects your kidneys from becoming damaged from the contrast dye that is used during this procedure. The scan is painless, however, it may take a little time to obtain the necessary pictures. An echocardiogram is an ultrasound scan of your heart. The scan can give clear pictures of the heart muscle, heart chambers and structures within the heart such as the valves. Electrodes will be placed on your chest to allow for a tracing of your heartbeat during the procedure. Some cold gel will be spread onyour chest and a transducer is placed on your ribs near your breastbone and directed towards your heart. The transducer will pick up the echos of the sound waves which transmit them as electrical impulses. The echocardiography machine converts these impulses into moving pictures of the heart. During the procedure you may be asked to breathe in a certain way and change your position. What preparation is required? No specific preparation is required and there are no risks attached to having this procedure performed. After the test is completed you can continue as normal. An angiogram is a test, using dye and x-ray, to detect if there are any problems in the arteries, valves or chambers of the heart. This test might be performed if you experience tightness or pain in the chest, jaw or arm. 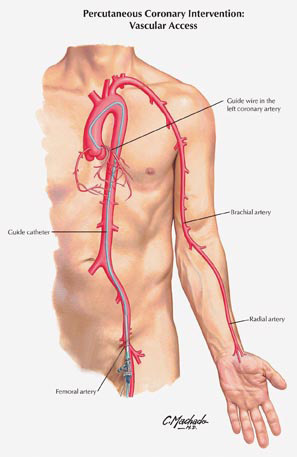 A catheter is inserted via the femoral artery (top of the leg) and fed into the bigger artery. The contrast dye is injected and a number of x-rays is taken. You can have an angiogram of your coronary (heart) or renal (kidney) arteries. Complications of this test include bleeding and a formation of bruising at the catheter site, or occasionally, further deterioration of kidney function. What preparation is required? Your doctor will explain the procedure to you and will ask you to sign a consent form to state that you understand the procedure and possible complications. Some complications may include irregular heart rhythms, chest pain, allergic reaction to the dye, bleeding at the groin site and, very rarely, heart attack or stroke. You will be asked to remove your jewellery and be provided with a hospital gown. It will be necessary to take some blood samples, which will be sent to the laboratory, to ensure it is safe to perform this procedure. Your doctor will also place a needle into your vein (cannula). It may be necessary for you to take medication (n-acetylcystine), prior to this test, to protect your kidneys from the dye that is required for the test. What will happen after the procedure? After the procedure, you will be asked to remain on bed rest for 6 hours to allow the puncture site to heal completely. You will need to drink plenty of fluids for the following 24 hours providing you are not on fluid restriction. This will help to flush the dye from your system. A bedpan/urinal will be provided if required. It is very important that you do not bend your leg or sit up before your rest time is over. The nurse will be checking your blood pressure, pulse and the site where the procedure was carried out. Inform the staff if you have pain or discomfort as pain medication can be given. Your doctor will discuss your results with you before you leave the hospital or at your next appointment. It may be necessary to commence some medication or go for further tests, depending on your results. Angioplasty may be required if your angiogram shows that there is atherosclerotic plaques (fatty deposits) in your coronary or kidney arteries, as this can reduce blood flow. Angioplasty is used to unblock these arteries in order to return good blood flow to the heart or kidney. In general, angioplasty is a safe procedure, but you should discuss the risks of this procedure with your doctor, as occasionally, the angioplasty may cause a rupture of the artery, requiring emergency surgery. This happens less than 5% of the time. What preparation is required? Your doctor will explain this procedure to you and will ask you to sign a consent form to state that you understand the procedure and possible complications. You will be asked to remove your jewellery and be provided with a hospital gown to wear. It will be necessary to take some blood samples, which will be sent to the laboratory to ensure it is safe to proceed with this procedure. Your doctor will also insert a needle into your vein (cannula) which is required for the procedure. It may be necessary for you to take medication (n-acetylcystine) prior to this test to protect your kidneys from the dye that is required for the test. Your doctor may also provide aspirin and/or Plavix, which are medications that help to thin the blood prior to the test. What will the procedure feel like? Instead of only injecting dye into the arteries the doctor will also pass a tiny wire into the narrowed or blocked artery. An angioplasty catheter will be placed over the wire, and when it is correctly positioned, the balloon at the end of the catheter will be inflated. You may feel symptoms of chest, jaw or arm pain. If this occurs, you will be encouraged to inform the doctor immediately. The balloon may be inflated and deflated several times to flatten the plaque against the walls of the artery and widen the vessel. Dye is then inserted to ensure the vessel is sufficiently widened. It might be necessary to have stents inserted (stainless steel mesh or coil) into the artery for further opening. properly or to confirm a diagnosis of rejection in transplant patients. What preparation is needed? You are admitted to the ward the day before or to kidney day care at 07.30am on the morning of your biopsy. You will be asked to fast from 12 midnight the night before the procedure. Your blood pressure will be checked and a blood sample taken to ensure that it is safe to proceed. The doctors will discuss the complications to you and obtain a written consent. The doctor will instruct you on any medications that need to be stopped prior to the procedure e.g. warfarin. How is the procedure performed? 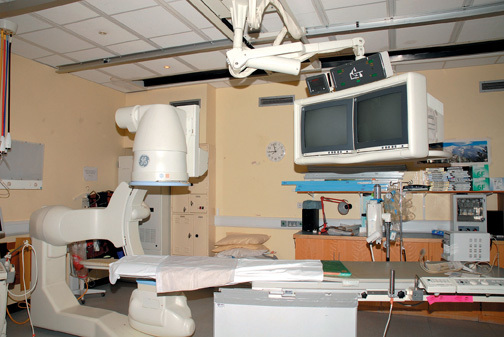 A kidney biopsy is carried out in the x-ray department or on the ward by the nephrologist. Mild sedation may be given prior to the procedure.If the biopsy is of your native kidney, you will be asked to lie on your tummy. If the biopsy is of your transplant kidney, you will be asked to lie on your back. 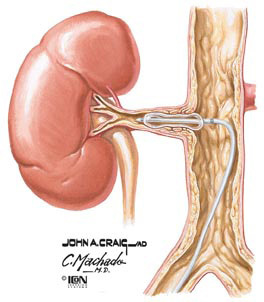 This allows the doctor easier access to the kidneys. The skin will be cleaned with antiseptic solution and a local anaesthetic will be given to numb the area. 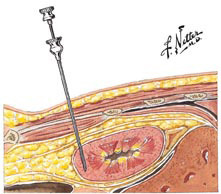 A special biopsy needle is introduced through the skin into the kidney to take the sample. Two or three samples might be required. What happens after the biopsy? Following the biopsy, you must stay in bed for 6 hours. This is to allow the puncture site to stop bleeding and help prevent any complications. Following the 6 hour period, you may mobilise gently to the bathroom only. Full mobility can resume the following morning if no complications have occurred. Your blood pressure and pulse will be monitored regularly and the biopsy site dressing checked. Each time you pass urine, it should be given to the nurse, who will then test it to see if there is any bleeding. Painkillers will be prescribed if you need them. You will be able to eat and encouraged to drink plenty of fluids (providing you are not on fluid restriction). You will be discharged the following morning if no other procedure or treatment is scheduled for you. It is advisable to avoid any strenuous exercise for a week after the biopsy to reduce the risk of bleeding. After this there should be no reason why normal activities cannot be resumed. If you experience severe pain over the biopsy area or notice blood in your urine, you should report back to your doctor. What are the possible complications during a kidney biopsy? Any medical or surgical procedure carries risks. Patients are asked to undergo procedures because it is felt that the benefits outweigh the risks. Complications of kidney biopsy are rare. The most important is bleeding, and you are closely monitored after the biopsy to detect bleeding. You may have pain or discomfort after the biopsy. Painkillers can be taken to reduce any discomfort. If you experience severe pain, after the biopsy, you should contact the kidney unit. When do I get the results? It takes up to 48 working hours for the laboratory to give a preliminary report and about a week to ten days to get a full written report. Your doctor will discuss the results of the biopsy with you and discuss appropriate treatments if required.